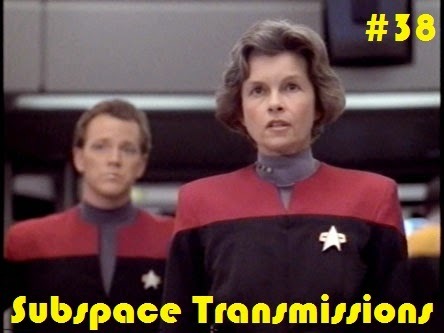 Subspace Transmissions: A Star Trek Podcast: EPISODE 38 - "STRANGEST STAR TREK TRIVIA"
Thanks to half a century's worth of productivity, there's no shortage of fascinating minutiae regarding the characters and world of Star Trek just begging to be analyzed and obsessed over. In this gloriously nerd-tastic episode hosts Cam Smith and Tyler Orton do just that, embarking on an archaeological expedition in search of some of the franchise's most wild and weird factoids and behind-the-scenes secrets. Among their treasure trove of uncovered gems are juicy details about discarded early visions of Geordi La Forge and Captain Janeway, alternate takes on Mr. Spock's digestive system and several glimpses into the evolution of Deep Space Nine. And, as an added bonus to show our appreciation to all of you, we engage in some serious Kai Opaka discussion. You can all rest easy now! Wanna appear on the show? Shoot us a 30 to 60-second audio clip letting us know your favorite STRANGE STAR TREK TRIVIA and you could take the spotlight in an upcoming program! You can also send any other questions, topic ideas or feedback to subspacetransmissionspod@gmail.com!